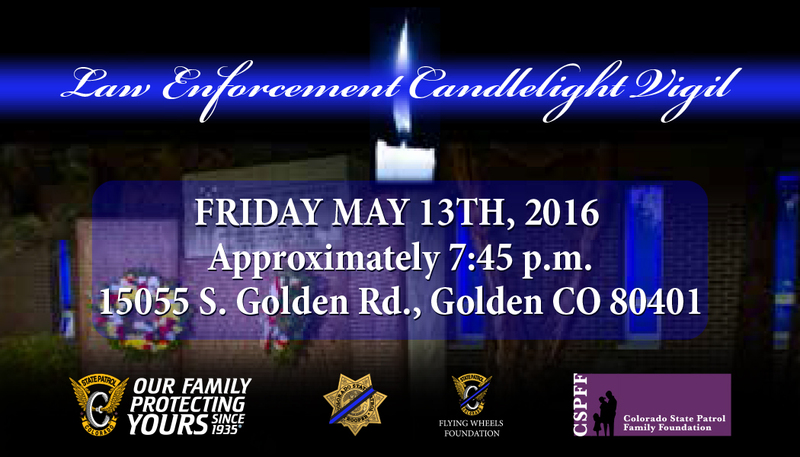 Please join us on Friday, May 13th as we gather with our families and friends to recognize Colorado’s fallen heroes. This ceremony will include the officers who lost their lives in 2015 and whose names will be placed on the National Law Enforcement Memorial on this same day. At approximately 7:45pm we will observe a moment of silence at the Colorado State Patrol Academy in Golden, lighting candles in honor of these heroes. In addition to paying tribute to each officer who has made the ultimate sacrifice, we want to join together to recognize the commitment, honor and family that the blue line represents for each of us as our law enforcement officers continue, each and every day, to serve and protect. Family participation is welcome and encouraged. Blue glow bracelets will be available for children in lieu of candles. If you are unable to attend, but would like to show your support, you may share the candle image below on your social media platforms. We recommend using this image as your profile picture on Friday, May 13th and leaving it for at least 24 hours in honor of our fallen heroes. This show of solidarity illustrates the honor of being part of the law enforcement family, as well as the support for those who gave all and those who continue to serve with honor and pride.